Again, if I wasn’t sick as a dog, I’d be at one of these shows. Cameron House with Rich Aucoin, The Superfantastics. El Mocambo for Besnard Lakes. Hideout for Still Life Still. Horseshoe for The Acorn, Sunparlour Players and maybe Plants and Animals. Lee’s Palace for Rebekah Higgs and The 6ixty8ights. Rivoli for Julie Doiron, Jenn Grant, Wil, Young Rival. Sneaky Dee’s for Camoflauge Nights…. 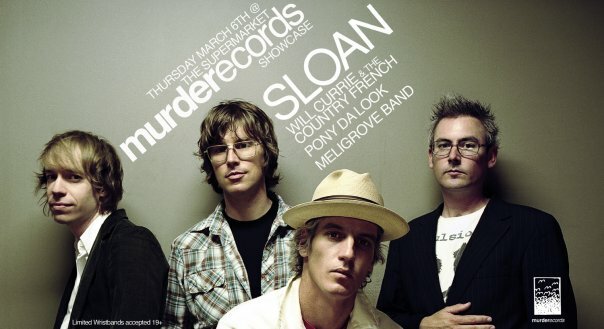 Murder Records Relaunch with Will Currie and the Country French, Pony Da Look, Meligrove Band, and SLOAN. Check CMW for more details.